WELCOME TO GARSTANG METHODIST CHURCH - A FAMILY CHURCH AT THE HEART OF THE COMMUNITY. 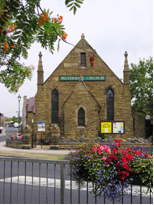 Garstang Methodist Church, in the North Lancashire circuit, seeks to serve God and the community by making the ministry of Jesus Christ relevant for the 21st century. Through our family friendly approach to Worship; Learning; Caring; Service and Evangelism, we believe we offer something for all the community. Whatever your age Garstang Methodist Church will welcome you into its 'Family' through any of the activities you see mentioned on this website. Copyright © 2015 Garstang Methodist Church.